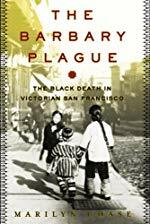 The veteran Wall Street Journal science reporter Marilyn Chase’s fascinating account of an outbreak of bubonic plague in late Victorian San Francisco is a real-life thriller that resonates in today’s headlines. The Barbary Plague transports us to the Gold Rush boomtown in 1900, at the end of the city’s Gilded Age. With a deep understanding of the effects on public health of politics, race, and geography, Chase shows how one city triumphed over perhaps the most frightening and deadly of all scourges. People think about the bubonic plague as a relic from the medieval period- but it has never left us. The last big outbreak was at the turn of the last century, in San Francisco. At first the cities leaders put their heads in the sand- and with the help of a very racist health official tried to tie the illness to the Chinese and deny it's ability to spread. This of course, was a disaster. Eventually a new health official who was not an idiot got in charge and with limited technology made an attempt to combat one of humanities oldest foes... and then the quake came. A great window into the San Francisco of the past, and the consequences of medical racism- to this day plague exists in prairie dogs out west, and it was this outbreak that caused it to become endemic in that rodent population, directly because the response to the initial outbreak was so botched.